Abramson, P. R., & Inglehart, R. (1987). Generational Replacement and the Future of Post-Materialist Values. Journal of Politics, 49, 231–241. Inglehart, R. (1997). Modernization and Postmodernization: Cultural, Economic, and Political Change in 43 Societies. Princeton,NJ: Princeton University Press. Some interesting points detailed here which I can use to counter relatives' attack on OC during obligatory family dinners. I agree with your interpretations but still have some queries over the extent of their validity. 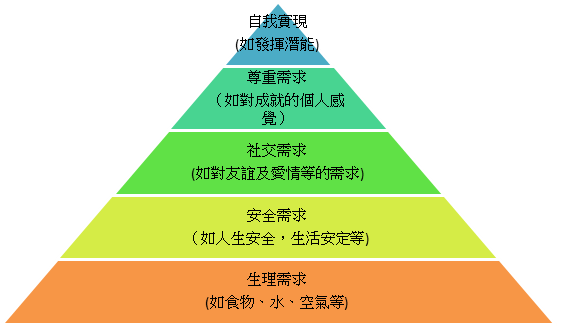 Citing Maslow's hierarchy of needs applies well to explaining individual motivations and actions, but can the same be extrapolated to group psychology as in the case of OC? Are there any limitations or possible fallacies in using this argument, or external factors governing aspects of group psychology that may override individualistic pursuits? A generalisation had also been made regarding how the younger generation grew up without the crushing poverty and peri-industrialisation living standards known to our elders. But doubtless within this cross section of young people there is still a proportion living in poverty relative to today's standards. How well is this group represented on the current OC cohort? Is support for OC uniform across all socioeconomic levels of the same age group? - If so, then how do those young people of low SE status seem to defy Maslow's hierarchy, coming out to fight for self actualisation before their deficiency needs are met? - If not, doesn't it suggest that there is an added component of socioeconomic influences in this group context rather than a purely generational struggle, as stated in your first 2 sentences?